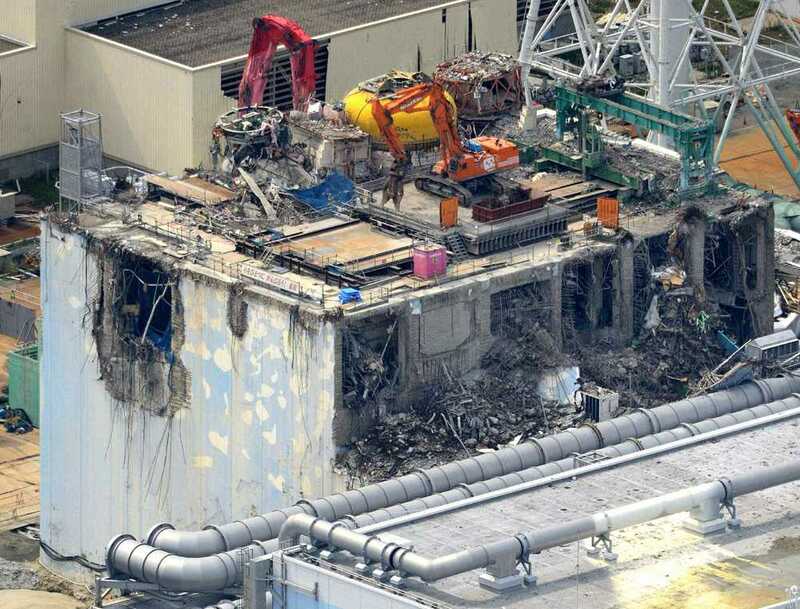 Fukushima was a man-made disaster, Democracy Now report (6 July 2012); with comment on which American nuclear plants are identical to General Electric's faulty Fukushima Daiichi design. Video Source: Youtube. With all this activity, you would scarcely remember that little thing about the three China Syndromes. Former Japanese government officials began talking about China Syndromes to the media in April, May and June of 2012. Aside from officials in the previous administration, there are also investigators, who claim that the China Syndrome took place and there was a cover-up to prevent panic (see reports here, here, here and here). Matsuda also remarked (see here) that an elephant's foot of molten corium formed at Reactor #4 (?!) and on 14 March 2011, the Japanese government planned to drop coolant on the plants from above with the help of the US Army. This plan was not implemented because it would have required the staff to abandon the reactors. It's hard to know whether to believe this interview or not. Matsuda looks like he was stressed and overwrought when he gave it. Matsuda mentions the China Syndrome at 1:20. Video Source: Youtube. If it is true that three China Syndromes occurred at Fukushima, the impact on Japan's society, land and entire economy would be catastrophic. The impact is likely to be felt worldwide, and no amount of muted press coverage will conceal that point. Click image to enlarge. Image Source: Fukushima Diary. 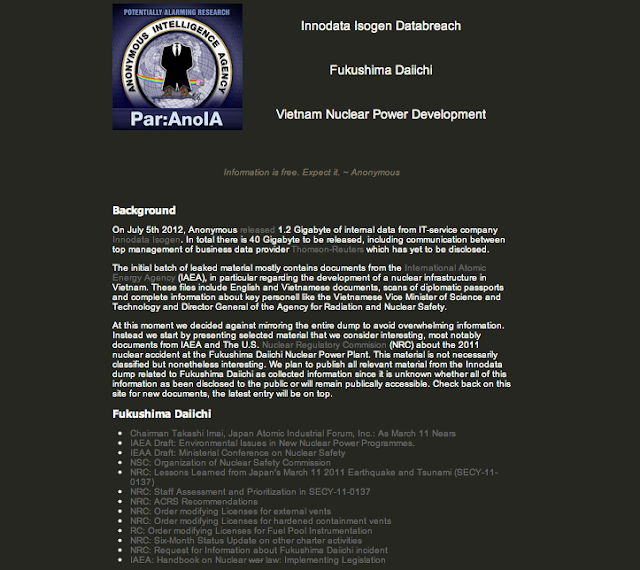 Given allegations of continual cover-ups, the computer hackers who support the increasingly-slick-looking Anonymous group hacked the International Atomic Energy Agency's computers and leaked IAEA documents online on 5 July 2012 (Hat tip: Fukushima Diary). The leaked documents cover nuclear power plant development in Vietnam. The documents also include IAEA correspondence with the US Nuclear Regulatory Commission over the Fukushima disaster. Anonymous has additionally hacked several local Japanese government sites, and the computers of Japan's Supreme Court. The documents mainly deal with nuclear plant safety provisions and assess whether or not they need to be revised. You can access the Anonymous leak (at the time of posting this piece) here. About 50 Japanese members of an international hacker group held an unusual protest against Japan's new copyright protection law. Members of the "Anonymous" collective wore the group's signature masks and silently picked up trash near Shibuya station on Saturday. The group opposes a new law that allows for stronger penalties on people who illegally download music or movie files. The law will take effect in October. The organizer of Saturday's event said it was designed to send a peaceful message of protest. The group says its members carried out cyber-attacks late last month on the websites of central and local Japanese governments, and the Supreme Court. Then there is Reactor #4. Not everyone is convinced that Fukushima Reactor #4's spent fuel pool (pictured at the top of this post) is dangerous. See a debate here. On the other hand, Australia's ABC reports (below) that the spent fuel pool is a serious threat. Video Source: Youtube (Hat tip: ENE News). Whether the press and governments acknowledge it or not, Fukushima is destroying the Japanese economy, just as Chernobyl ruined the USSR. TEPCO reported a $7.4 billion quarterly loss in August 2011. In response to vast public expenses (TEPCO was just nationalized) and a poor employment outlook, the government is injecting a bizarre generational angle into this nightmare. According to EX-SKF on 7 July 2012, the Japanese Prime Minister has proposed to lower the retirement age from 60 to 40 in order to 'increase the birth rate'; another aspect of this possible measure is that it would remove all job security from people 40 and above. There is no word on whether there would be an upper cap on who would be affected by this new measure (would Baby Boomers and their pensions be shielded from this new measure?). Nikkei Shinbun says the government committee on national strategy (chaired by Prime Minister Noda) has compiled the report on the government's long-term strategy called "Frontier Plan". What's in the "Frontier"? Japan is indeed going where no one has gone before. Noda and his people want to make the retirement age at 40, with the retirement money of 1 to 2 years worth of salary. Why? To make employment more mobile, to compete with developing nations. They want to eliminate the distinction between contract workers and full-time employees - i.e. cutting the benefits for full-time employees. In their mind, this somehow will translate into (hold your breath).... birthrate increase. How will an extremely insecure employment with the developing country-level wage lead to the increased birthrate? It won't, except in Noda and his experts' minds it will. Not only does this weaken the generation of people currently most capable of mounting a substantial critique and effort to deal with Fukushima's real and political fallout. It also curries favour with a younger Gen Y Japanese - those angry, alienated, anti-nuclear protesting students who are under the age of 35. In short, it will buy them off with full time jobs and social privileges stolen from their middle-aged predecessors. Given Japan's poor birth rate, is this proposal simply pushing Japan's resources toward those capable of future child-bearing? One blogger fears that Noda has seen the estimates on post-Fukushima life expectancy, and he is merely moving policy to align with a future Japan whose citizens will die at a much younger age. In other words, Gen Y will see itself supported, but not understand the horrific underlying expectation behind that unfair support: that they are not expected to live past middle age. See another report on this nasty idea here. In this generational case, one could see the worst of two worlds: firstly, Boomers' fateful support of nuclear power; plus secondly, their tinkering with retirement ages and rewriting of employment regulations, which turn permanent jobs into contract labour to secure their own current positions at the expense of their successors. The Japanese PM (born 1957) is unwise to turn Fukushima into a generational issue. In so doing, he might rebuild relations with younger people (see my posts on tensions between Japanese Gen Y and Boomers here and here). A normally deferential society, Japan has a rare tradition of younger people rising up if their elders fail them. By avoiding that problem, Noda will undoubtedly win new enemies among Gen Xers. It is an ominous sign of a hardening of attitudes, a closing down of options, and a rise in dog-eat-dog opinions. My earlier posts about Baby Boomers and the Fukushima disaster previously revealed a broader range of responses - from an astonishing view of Fukushima as an opportunity for spiritual redesign and eco-friendly nuclear green power against global warming - to Japanese Boomers' generational sacrifice. If only these problems were confined to Japan. Independent academic studies of fallout in North America are due out shortly, and these reports may receive more media coverage. But in an American election year with a dragging economy, especially in fault-lined, nuclear-powered California, no politician has a vested interest in revealing the full scale of the impact of radioactive fallout on the western coast of North America. Holy smoke. This is so well written and researched, like all your posts. I'm just stunned by the stuff about Japan's over-40. Your analysis of this is so spot-on. I think a lot about why people don't talk more about things like this - why we navigate more readily to sites that offer funny pictures or entertaining stories. I think we all feel helpless to do anything. Of course, that's not an excuse to bury your head in the sand and be all about your own rice bowl. The part about Imperialism - true, also. Very frightening. And, of course politicians will not talk about this stuff - even in a non-election year. What a waste of clay most of them turn out to be. Also, I did not know "Chernobyl ruined the USSR." I want to be the first to say -- there's going to be a movie. And, it's going to be called "Hydrangea Revolution." I can't believe this has happened to Japan. Did you know that a year or so ago they announced a blogger program? My friend Andi and I were thinking of applying. It was designed to generate tourism interest b/c the industry has suffered so much since the accident. They announced that in April 2012 they would begin a recruiting/competition for 100 or so bloggers to gain free airfare to Japan. In exchange, we'd blog about the country. We're all in denial. @Jen - Thanks very much for your comments. I think Fukushima is one of the most dramatic instances of the renegging of intergenerational responsibility, of a broken social contract. The finding that the disaster was due to human failure and neglect of the safety codes underscores this. The life of the plant exactly coincides, rather notoriously, with the past 40 years (Daiichi was commissioned in 1971). As for free airfare there, and traveling there, hmm. They changed their minds about a similar offer to bump up tourism? Was this part of the same program? At any rate, until they track down where those three coriums are, the somewhat healthier option might be for you to blog about what Gen X thinks of Fukushima fallout in the USA. There are also a lot of worries about aging nuclear plants and new nuclear plant construction not just in North America (San Onofre comes to mind: http://blogs.laweekly.com/informer/2012/06/earthquake_big_one_power_outage_california.php) but across South America, Europe, Russia, Asia and now in developing countries. Nuclear energy - and energy in general - is one of the biggest generational problems Gen X faces. It is our generational duty to contend with that fact. In that regard, I don't think we are helpless at all. These problems have to be openly researched and discussed, and the Internet enables this. We must do what we can to try to resolve this terrible mess. And yet, I think Fukushima is a lesson in what we *can't* do (a real anathema to the heady 'we can do anything with science and tech' mentality) - it's an example of how we have been outstripped by our own technology. A commenter on the ENE site said: "We do not have the technology at present time to clean up this mess, that technology is far in the future, could be thousands of years." (http://enenews.com/gundersen-latest-probe-unit-1-indicates-nuclear-fuel-left-containment-audio) We feel caught between present and future every day (daily personal time management is probably the most obvious aspect of this problem) but in this case that shortfall is deadly. The fact that so many people are oblivious to what is happening in Japan, or are burying their heads in the sand, and the media are not talking about three core meltdowns and constant fallout - is amazing. But it could be because we have gotten in over our heads and TPTB do not know what to do. We're in a holding pattern of media-supported ignorance and silence. That silence is especially amazing when one considers that nuclear power is tied to nuclear weaponry, the energy crisis, the Middle East conflict and the global financial crisis. What if no one significant is talking about Fukushima because the disaster has actually proven two things and dealing with those two things is unthinkable? --> (1) that nuclear energy is not viable because, while it can work for a few decades without trouble, if / when something goes wrong in an aging plant with lax staff, the meltdown(s) and clean-up **will wipe out the economy of any minor country or major world power using this technology**? (as it did with the USSR (Gorbachev said this) and as it has with Japan?) and -->(2) what if Fukushima has effectively ruined the entire Japanese economy and society, and the media blackout is merely concealing the total destruction of a G8 country? Would not the ensuing global imbalance portend wars and conflict in Asia, due to the ensuing geopolitical strategic imbalance? Knock a major player like Japan out of the game, and serious trouble will follow. Sometimes I get the impression that Fukushima is the sideshow to the sideshow, the problem no one is following too closely, where the whole house of cards could come down. That's not a certainty. But it is possible, and much depends on whether they have another big earthquake there. Regarding Gen X and other generational groups facing this nightmare: I am not suggesting that we all become anti-nuke activists. But we can change how we think about energy problems in terms of strategy, power, exploitation, control, competition and irresponsibility. I don't think it is helpful to retreat into formulaic political arguments about energy concerns. There has to be an acknowledgement of the interrelatedness of the problem of energy. We are all in this together and the entire Post WWII nightmare demands a sea change in how we think about the world and how we power the science and tech - and arts - which we value so highly. Again, no matter what policy makers say, we are all in this together. For example: Fukushima fallout will pollute family gardens and parks in the western and midwestern United States. It has affected and will affect rain water and well water and crops across the USA and Canada, and further afield. It is already in California produce. Pro-nuclear commentators claim that such fears are overstated. To me, the worst sign that there is something really wrong here and something to worry about regarding fallout is that there is no high profile coverage of it in the media. If there is nothing to worry about, where are the centralized government Websites with regular local atmospheric fallout readings and Fukushima fallout test results for American and Canadian produce locally available in stores, such as almonds, soft fruits, mushrooms, Pacific fish, milk, etc. etc.? I realize that testing takes a lot of money and effort, and in a recession, things happen slowly.